The Sikh religion was founded by Guru Nanak (1469 – 1539), who drew upon the teachings of Muslim Sufis and Hindu Bhaktas. In its purest form Sikhim is about unity, simplicity, equality and surrender (to God), and the verses of the Sikh Gurus- most of them included in the Granth Sahib – articulate this beautifully. This elegantly illustrated edition contains a selection of verses from the Guru Granth Sahib and other sacred texts like Guru Tegh Bahadur’s Vairagmayi Bani and the Dasam Granth of Guru Gobind Singh. Brilliantly translated by Khushwant Singh, leading scholar of Sikh history and culture and best – selling author, these moving mystical hymns retain the immediacy and the lyricism of the originals. In addition, vibrant and imaginative illustrations by Arpana Caur, one of India’s most celebrated artists, make this a collection to treasure. Khushwant Singh is India’s best – known writer and columnist. He has been founder – editor of Yojana, and editor of the Illustrated Weekly of India, the National Herald and the Hindustan Times. He is also the author of several books which include the novels Train to Pakistan, I shall Not Hear the Nightingale, Delhi, The Company of Women and Burial at Sea; the classic two – volume A History of the Sikhs; and a number of translations and non – fiction books on Sikh religion and culture, Delhi, nature, current affairs and Urdu poetry. His autobiography, Truth, Love and a Little Malice, was published in 2002. Khushwant Singh was a Member of Parliament from 1980 to 1986. He was awarded the Padma Bhushan in 1974, but returned the decoration in 1984 in protest against the storming of the Golden Temple by the Indian Army. In 2007, he was awarded the Padma Vibhushan. Arpana Caur was born in 1954 in Delhi. Her works have been exhibited since 1974 in India and abroad, and can be found in museums of modern art in Delhi, Mumbai, Bhopal, Chandigarh, Victoria and Albert Museum and Bradford in the UK, Singapore, Dusseldorf, Hiroshima, Los Angeles and San Francisco. She is inspired by her mother Ajeet Cour’s writings, Gurbani, the Pahari miniature and Indian folk – art traditions. She has been a recipient of the Gold Medal in the sixth Triennele, apart from other awards and grants. The Sikh religion, a synthesis of Hinduism and Islam, is among the youngest of the world’s major religions. 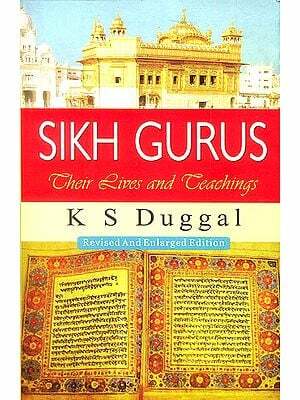 The word Sikh is derived from the Sanskrit ‘shishya’ or the Pali ‘sikkha’, meaning disciple. The Sikhs are the disciples of there ten Gurus and worship the Granth Sahib (or Adi Granth), which is a compilation of hymns composed by the Gurus and other saints of medieval India. A striking feature of Sikhism is its emphasis on prayer. The form of the prayer is usually the repetition of the name of God and the chanting of hymns in God’s praise. Most of these hymns are contained in the Granth Sahib, and the remaining few are to be found in the Dasam Granth of the tenth and last Guru, Gobind Singh. The hymns were composed by Hindu Bhaktas and Muslim Sufis – Farid, Namdev and Kabir, among others – and by the Gurus themselves, who were poets of great sensitivity. In this book I have put together a selection of hymns by the first five Gurus and the ninth and tenth Gurus (the sixth, seventh and eighth Gurus did not write any), Together, they communicate the essence of Sikhism. The Sikh faith was founded by Nanak (1469 – 1539), the first Guru of the Sikhs. He was born in a village called Talwandi, about forty miles from Lahore. His parents were Hindus belonging to a Kshatriya subsect known as Bedis, that is, ‘those who know the Vedas’. Nanak was taught a little Arabic and Persian, some Sanskrit, Hindi and accounting. But his mind was never in his work. He spent his time meditating and seeking the company of wandering hermits. His parents found a wife for him when he was eighteen, and the couple had two sons. But Nanak soon lost interest in his family and reverted to meditating and wandering. A Muslim rebeck – player, Mardana, joined him, becoming his first disciple. Nanak composed hymns, Mardana set them to music, and the two began to organize community hymn – singing. In the year 1499, when Nanak was thirty years old, he had a mystic experience. One morning while bathing in a stream, he disappeared under the water. According to his biographers, he found himself in the presence of God who spoke to him thus. ‘Nanak, I am with thee. Through thee will my Name be magnified Go into the world to pray and each mankind how to pray. But be not sullied by the ways of the world. Let your life be one of praise of the Word (Nam), and of charity (daan), ablution (ishnaan), service (seva) and prayer (simran).’ Nanak was missing for three days and nights. When he came back, the first thing he said to the people who thronged to greet him was, ‘There is no Hindu; there is no Mussalman. Nanak took to preaching. Accompanied by Mardana, he traveled extensively, within India and also abroad (it is believed that he traveled to places as distant as Sri Lanka, Tibet and Mecca). He visited many holy cities of the Hindus and the Muslims, pointing out the folly of meaningless ritual and emphasizing the common aspects of the two faiths. He spent his last ears in a town called Kartarpur – meaning ‘The abode of the Creator’ – preaching and composing and singing hymns. He died in 1539 at the age of seventy. He was acclaimed by both Hindus and Muslims as the king of holy men. Nanak’s teaching reveals the influence of both Hinduism and Islam. By the fifteenth century these religious systems had evolved some beliefs that had much in common. It was from the teachings of the Muslim Sufis, notably Sheikh Farid, and the Bhaktas, primarily Kabir, that Nanak drew his inspiration. From Islam, Nanak took its unqualified monotheism, rejection of idolatry and of the caste system. From Hinduism, he borrowed the metaphysics of the Upanishads and the Gita. He elevated reality (sat) to the position of the one supreme God. He accepted the theory of Karma and transmigration of souls. The path he advocated was of bhakti, emphasizing the worship of the name of God (Nam – marga). He rejected asceticism and propagated the grihastha – dharma (religion for the householder) and advocated the necessity of taking on a guru and keeping company with holy men (saadh sangat). Nanak also set great store by community hymn – singing (kirtan). He advised his followers to rise before dawn and listen to religious music, for he believed that in the stillness of the ambrosial hours (amritvela), one is best able to commune with God. When Nanak died he left behind him a small community of Hindus and Muslims who described themselves as Nanak – panthis – followers of Nanak’s way. They could at best be described as a group dissenting from both Hinduism and Islam. It was left to Nanak’s successors to mould this group into a community with its won language and literature, religious beliefs and institutions, traditions and conventions.